Their conclusion was that single-use, flimsy disposable plastic bags are the best option in terms of environmental and climate costs (however, the Ministry's analysis did not factor in marine life impacts of these bags, which are severe). Update: Arthur Yip's Twitter thread on the study points out some methodological problems with the study: "The required reuse number actually varies from 52x - 7100x! 52x is very doable! This is a ridiculously different result than 7100x. Use a cotton bag once/week for a year & it will have "paid off". We're talking abt nice cotton cloth bags, not the thicker plastic ones...Notably, 52x on climate. 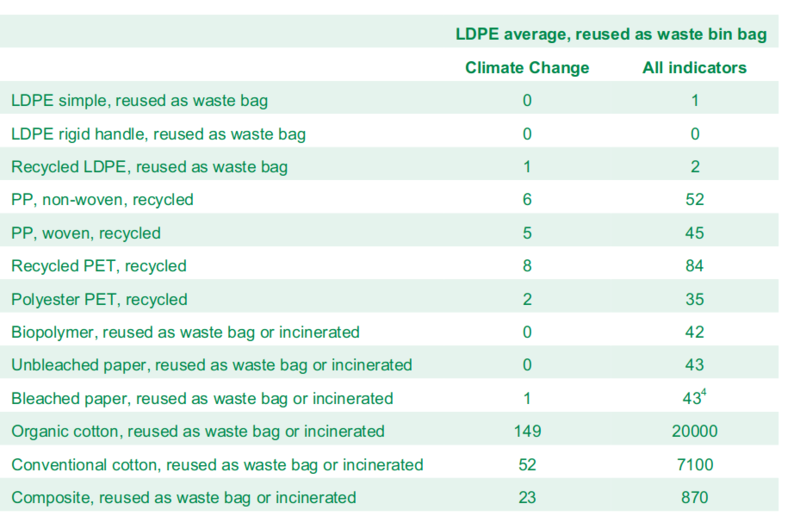 After using a cotton bag 52x, cotton has lower climate impact than plastic! Again, this is very different from "7000x" or even the average number, 840x, which equally weights all the impact categories discussed... It also did not go through academic peer review. I can only hope that further reviews would have identified the problems I noted and forced the authors to provide some more clarity, footnotes, &re-consideration into how the information was presented and would be interpreted."